Its my Mother-in -laws 70th Birthday soon and I wanted to make her something special. I haven't actually made her anything before, which is shameful because she has made me many things and always returns home from overseas trip with a skein of yarn for me. The yarn was part of the last load of yarn to make it into the stash tub before it was declared closed for the year. I bought it from Spendigo (Bendigo Wool and Sheep Show) when I saw it I immediately knew that my Mother-in-law would love it. It is merino plied with a single thread of silver which makes it sparkle. What I didn't consider was how much trouble I would be in with Miss K for returning from my marvellous yarn trip with amazing yarn which wasn't for her. When it came to choosing a pattern, I knew that my Mother-in-law had always admired the lace shawls that I had knit in the past but finds shawls difficult to wear and often wears scarfs. To be very honest, I find traditional scarfs really boring to knit and wanted something that as fairly simple, would showcase the yarn and result in a finished object that was worthy of a birthday gift. I trawled through Ravelry for a suitable pattern, this is one of my favourite past times, and found Frisson by Brittany Wilson. I didn't quite have enough yarn to knit the last repeat of the pattern so I ripped back to the end of the previous section and cast off. Leaving me with a little bit of yarn to make something for Miss K.
This is not my Mother-in-law, this is my friend Kate who agreed to model for me. And this photo is for you Michelle, look what's in the background! 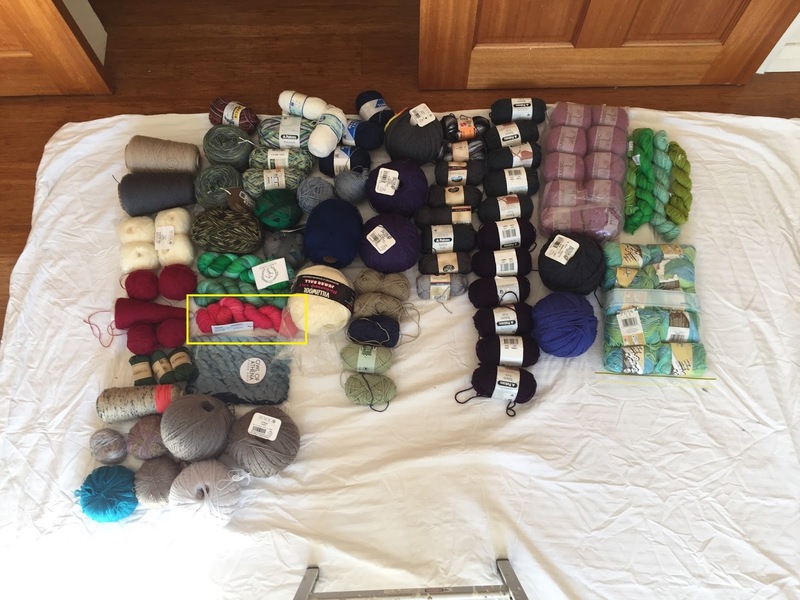 This is just fabulous Louise, I loved the first shot of the yarn highlighted in the stash shot. The finished shawl/scarf is lovely, like a scarf but with more shaping and pattern, and all the photos of it, fantastic! Woohoo! I love this. Hopefully my MIL will love it.